Everything will be done in the command line with the utility dfsrmig, already integrated with Windows. You will see that the process is very simple, but do not go too fast. The migration goes into preparation mode, a copy of SYSVOL will be created with the name SYSVOL_DFSR. It allows to visualize the state of progress of the stage that we have just launched. If one or more CDs are returned is that it is not over yet, we must wait again. The SYSVOL_DFSR copy will be mounted on the SYSVOL share instead of the copy that runs on FRS. During this operation you have to wait again. When you get this message, you can continue to the 3rd step. It is necessary to wait until FRS is removed on all DCs and DFSR is operational. When you reach this state, you can consider that the replication is migrated to DFSR! If you access the Event Viewer, you will notice different events related to DFSR. This takes a little more detail what we saw in the command line with dfsrmig. 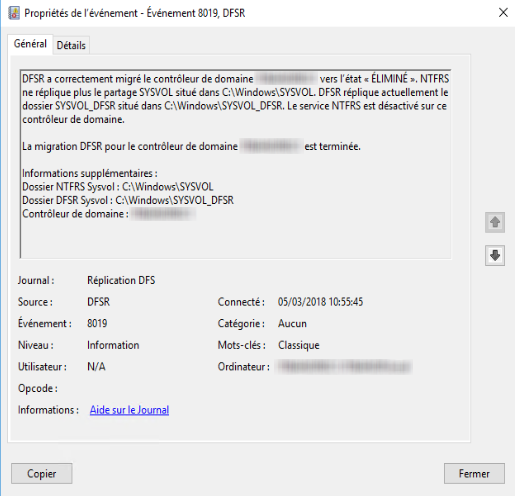 You will see the message "The DFSR migration for the my-server domain controller is complete" within an event with ID 8019. Finally, if you look on your domain controllers you have a folder "SYSVOL_DFSR" which is shared as SYSVOL and now corresponds to your SYSVOL in production. If your antivirus is suspicious with SYSVOL, consider changing the SYSVOL exclusion path to SYSVOL_DFSR. Good luck with your migration! Sign up now to earn FREE STEEM! You are wrong now thanks!!! !